What do we mean by higher voltage during discharge, and why would you care? In drag cars and motorcycles, a 16V (or 12V) battery is commonly used without an alternator (total loss setup). Drag cars are commonly run without an alternator, because you only need the battery to last for a short period down the drag strip. You avoid the drag of the alternator, and by using a 16V battery instead of a 12V battery, everything will run better. The disadvantage is having to charge the battery in-between runs (there's more than enough time to charge the battery in-between runs, in fact the battery can last a few runs between charges). What about a non-drag, 12V battery application? Race cars with an alternator will also run alternator-less in the rare event that the alternator fails. When the alternator is working (which should be most of the time), the higher discharge voltage of a Voltphreaks battery does not provide an advantage, though the more efficient charging of the Voltphreaks battery will be an advantage over a standard lead-acid battery. When running with an alternator, the alternator puts out a constant voltage, and there will be no difference in system voltage between a Voltphreaks battery or a lead-acid battery. But if run without an alternator, 12V lead-acid batteries will discharge with a system voltage in the 12V to 11V range. A Voltphreaks battery will maintain a flat 13V during most of it's discharge! That extra volt makes a huge difference. If using a Voltphreaks 16V battery in most total loss drag racing applications, voltage will be 15.5 to 16V+ during discharge, allowing everything to run better! 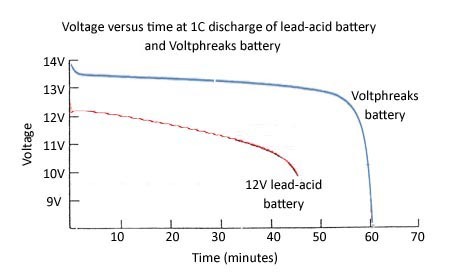 Below is a 12V discharge curve showing voltage of a Voltphreaks battery compared to a similar lead-acid battery.